Increased (intra)renal activity of the renin-angiotensin system may cause a persistent increase in renovascular resistance and intraglomerular pressure in patients with diabetes, thus contributing to the development of diabetic renal damage. The effect of chronic angiotensin II subtype 1 receptor blockade on (intra)renal hemodynamics in patients with type 2 diabetes was examined in a double-blind parallel group study. Patients were treated with 40 mg of olmesartan (n = 19) or placebo (n = 16), and renal hemodynamics were assessed before and after 12 wk of treatment using inulin and para-aminohippurate clearance techniques. Olmesartan significantly reduced 24-h ambulatory systolic and diastolic BP (both P < 0.05). In parallel, effective renal plasma flow increased significantly from 602 ± 76 to 628 ± 87 ml/min per 1.73 m2, whereas filtration fraction and renovascular resistance decreased significantly (all P < 0.05). With placebo treatment, effective renal plasma flow decreased and filtration fraction increased significantly (both P < 0.05). GFR was not affected by both treatments. Active plasma renin concentration increased considerably (P < 0.05) with olmesartan therapy but remained unchanged with placebo treatment. Nitric oxide metabolism (plasma nitrate and nitrite) and asymmetric dimethylarginine blood levels were not affected by olmesartan and placebo therapy. In contrast, plasma 8-isoprostane 15(S)-8-iso-prostaglandin F2a concentration, a biochemical marker of oxidative stress, decreased significantly (P < 0.05) with olmesartan treatment. Chronic angiotensin II subtype 1 receptor blockade decreases (intra)renal vascular resistance and increases renal perfusion despite significant BP reduction. In addition, it significantly reduces oxidative stress. These effects of angiotensin II receptor antagonists may contribute to their beneficial long-term renal effects in patients with type 2 diabetes. Short-term studies in patients with type 1 and type 2 diabetes have revealed a striking renal vasodilator response to acute administration of inhibitors of the renin-angiotensin system (RAS), reflecting increased renovascular resistance (RVR) possibly resulting from (intra)renal RAS activation (1–3). In addition, we and others have documented enhanced renal (postglomerular) vasoconstrictor response to angiotensin II (Ang II) in patients with diabetes as compared with individuals without diabetes (4,5). As a result, chronic efferent arteriolar vasoconstriction caused by (intra)renal RAS activation may cause intraglomerular capillary hypertension, theoretically predisposing to the development of diabetic renal disease. Experimental support for this hypothesis has been elaborated in animal studies (6), but the evidence from human studies is limited. In cross-sectional studies in hypertensive patients with the metabolic syndrome, increased RVR was accompanied by microalbuminuria (7,8). Observational studies on the natural course of renal hemodynamics and the development of microalbuminuria in patients with type 2 diabetes are restricted to the measurement of GFR, however (9,10). Moreover, placebo-controlled prospective trials that have evaluated chronic effects of Ang II subtype 1 receptor antagonists (AT1-RA) on (intra)renal hemodynamics in patients with type 2 diabetes are not available. We examined the effect of the AT1-RA olmesartan medoxomil on renal hemodynamics in patients with type 2 diabetes in a randomized, double-blind, placebo-controlled, parallel group study. We assessed GFR and effective renal plasma flow (ERPF) using steady-state inulin and para-aminohippurate (PAH) clearance techniques. In addition, we measured the renal resistance index (RI) using Doppler sonography to evaluate the utility of this noninvasive method for assessment of changes in renal hemodynamics with chronic therapeutic interventions. Finally, we measured plasma active renin and parameters of nitric oxide (NO) metabolism and oxidative stress. Patients were examined before and after 12 wk of treatment with olmesartan or placebo. The present study was a single-center, randomized, double-blind, placebo-controlled, parallel-group study that was conducted at the Medical School Hannover (Hannover, Germany). The study protocol was approved by the Medical School Hannover Ethics Committee, and all participants gave written informed consent. Eligible for inclusion were normotensive or hypertensive male and female patients who had type 2 diabetes (diagnosed at the age of 30 yr or later) and were between 40 and 60 yr of age. Patients had no clinically relevant cardiovascular, hematologic, autoimmune, gastrointestinal, or hepatic disease or cancer. Patients with known hypersensitivity or contraindication to AT1-RA or related drugs were not studied. After a taper-off period of at least 2 wk for patients with previous antihypertensive treatment (4 wk for patients who were pretreated with angiotensin-converting enzyme inhibitors or AT1-RA), patients were randomized to one of the two treatment groups receiving either 40 mg of the AT1-RA olmesartan medoxomil or olmesartan medoxomil matching placebo once daily for 12 wk. During the taper-off period, patients with previous antihypertensive medication and/or patients in whom BP was not adequately controlled, i.e., those who had a sitting diastolic BP >85 mmHg, received up to 25 mg of hydrochlorothiazide (HCTZ) once daily (this procedure was requested by the Ethics Committee). In addition, when BP after randomization to the active treatment arms was not adequately controlled, patients additionally received up to 100 mg of atenolol during the first 4 wk to reach the above target sitting diastolic BP. BP was monitored throughout the study at regular visits using an automated device (Dinamap, Critikon Co., Tampa, FL). In each patient, sitting BP was measured between 7:00 and 11:00 a.m., and the mean of three measurements was calculated for the safety records. In addition, all patients underwent automated 24-h ambulatory BP measurements (Diasis Integra II; Novacor GmbH, Hamburg, Germany) after the taper-off period, i.e., before randomization to the double-blind medication, and at the end of the 12-wk treatment period. Treatment compliance was assessed by tablet counts. During the study, patients were not allowed to take any other antihypertensive drugs. The study was conducted in agreement with international standards for clinical trials. It was supervised by an independent international clinical research organization. Before randomization to the active treatment and after 12 wk of double-blind treatment, renal hemodynamics were assessed using the steady-state inulin and PAH infusion techniques as described in detail elsewhere (11). For this purpose, patients were examined after an overnight fast in supine position in the metabolic ward. After an inulin and PAH bolus and an equilibration period of 90 min, blood samples were taken at regular intervals during continuous infusions of inulin (10 mg/m2 per min) and PAH (8 mg/m2 per min). In parallel, mean arterial BP was monitored with Dinamap at the same time points for calculation of RVR. Furthermore, samples for measurements of plasma active renin, l-arginine, asymmetric dimethylarginine (ADMA), nitrite and nitrate, and the 8-isoprostane 15(S)-8-iso-prostaglandin F2a (15(S)-8-iso-PGF2a) concentrations were also taken after 90 min of supine position. All samples were immediately cooled on ice and centrifuged at 1500 × g at 4°C for 10 min. The supernatants were stored in aliquots at −80°C until further use. All samples were labeled with a code, and the analysts were not aware of the status of the samples. In addition to the invasive renal clearance measurements, renal resistance index was assessed in all patients before and after the double-blind treatment period with Doppler-sonography using an Ultramark 9 HDI ultrasound machine (ATL, Bothell, WA) as described in detail elsewhere (12). In brief, intrarenal Doppler signals were obtained from two to three representative proximal segmental arteries. The peak systolic velocity (Vmax) and the minimal diastolic velocity (Vmin) were determined, and the renal segmental arterial resistance index was calculated as 100 × [1 − (Vmin/Vmax)]. The results from two or three measurements were averaged. All measurements were performed by the same investigator. Routine chemistry was analyzed using standard laboratory equipment and certified methods. Inulin plasma concentration was measured enzymatically with inulinase, and that of PAH was measured photometrically. Inulin and PAH clearances were calculated as described previously (11). Filtration fraction was calculated as the ratio inulin/PAH clearance (i.e., GFR/ERPF), and RVR was calculated using the equation RVR = [(mean arterial BP − 12) × 723/ERPF]. Active plasma renin concentration was measured with an immunoradiometric assay using a highly sensitive and specific monoclonal renin antibody (Renin III Generation; E.R.I.A. Diagnostics Pasteur, Paris, France). Plasma l-arginine and ADMA levels were determined by gas chromatography–tandem mass spectrometry (GC-MS-MS) (13). l-Arginine is the amino acid precursor of NO, whereas ADMA is a potent endogenous inhibitor of the NO synthase (14). Plasma nitrite and nitrate concentrations were determined simultaneously by GC-MS (15). Both nitrite and nitrate in plasma are used as measures of NO production. Plasma concentrations of free plus esterified 15(S)-8-iso-PGF2a were measured by GC-MS-MS after alkaline hydrolysis and immunoaffinity column chromatography extraction as described elsewhere (16); 15(S)-8-iso-PGF2a and other isoprostanes are reliable biomarkers of oxidative stress (17). Descriptive summary statistics for baseline and demographic parameters are given for both treatment groups. Analyses of changes in renal hemodynamics and other data were performed using a parametric single-slope ANCOVA model. All statistical tests were two-sided tests with a significance α level set at 0.05. Data are presented as mean ± SD. Thirty-five patients with type 2 diabetes were randomized to one of both treatment arms. Descriptive baseline characteristics of patients who were randomized to the olmesartan and placebo treatment arms are presented in Table 1. Because patients in both treatment arms received HCTZ during the taper-off period, sitting systolic and diastolic BP measured with Dinamap were comparable between groups at the beginning of the active treatment period (Table 1). In the taper-off period, nine patients who were later randomized to olmesartan and eight patients who were later randomized to placebo received HCTZ. With active treatment, 24-h, daytime, and nighttime systolic and diastolic BP assessed by 24-h ambulatory BP measurements decreased significantly in patients who were treated with olmesartan, whereas in the placebo treatment group, BP decreased slightly but not significantly (Table 2). In the olmesartan treatment arm, none of the patients needed atenolol co-therapy, whereas three patients in the placebo treatment group additionally received atenolol. Chronic Ang II receptor blockade with olmesartan did not affect GFR (before treatment, 120 ± 16 ml/min per 1.73 m2; after treatment, 119 ± 17 ml/min per 1.73 m2). Similarly, placebo treatment had no effect on GFR (before treatment, 114 ± 18 ml/min per 1.73 m2; after treatment, 114 ± 18 ml/min per 1.73 m2). In contrast, ERPF increased significantly (Figure 1A), whereas filtration fraction (Figure 1B) and RVR (Figure 1C) decreased significantly with AT1-RA therapy. With placebo treatment (HCTZ and atenolol co-therapy), we observed a significant increase in filtration fraction (Figure 1B) and a nonsignificant increase in RVR (Figure 1C). The renal artery RI was unchanged with placebo treatment (before treatment, 0.68 ± 0.04; after treatment, 0.68 ± 0.05; NS), whereas it decreased slightly but not significantly with olmesartan therapy (before treatment, 0.69 ± 0.03; after treatment, 0.67 ± 0.04; NS). Renal hemodynamics in patients with type 2 diabetes before and after chronic treatment with the angiotensin II (Ang II) receptor antagonist olmesartan (n = 19) or placebo (n = 16). Presented are changes of effective renal plasma flow (A), filtration fraction (B), and renovascular resistance (C). Data are shown as the 95% confidence interval of the mean. *P < 0.05 versus baseline. Plasma concentrations of l-arginine, nitrite, nitrate, and ADMA before and after the active treatment period with olmesartan and placebo are presented in Table 3. We found no statistically significant changes of these parameters with AT1-RA and placebo treatment. In contrast, plasma active renin increased markedly with chronic olmesartan therapy, indicating profound RAS inhibition, whereas it was unchanged with placebo treatment (Table 3). 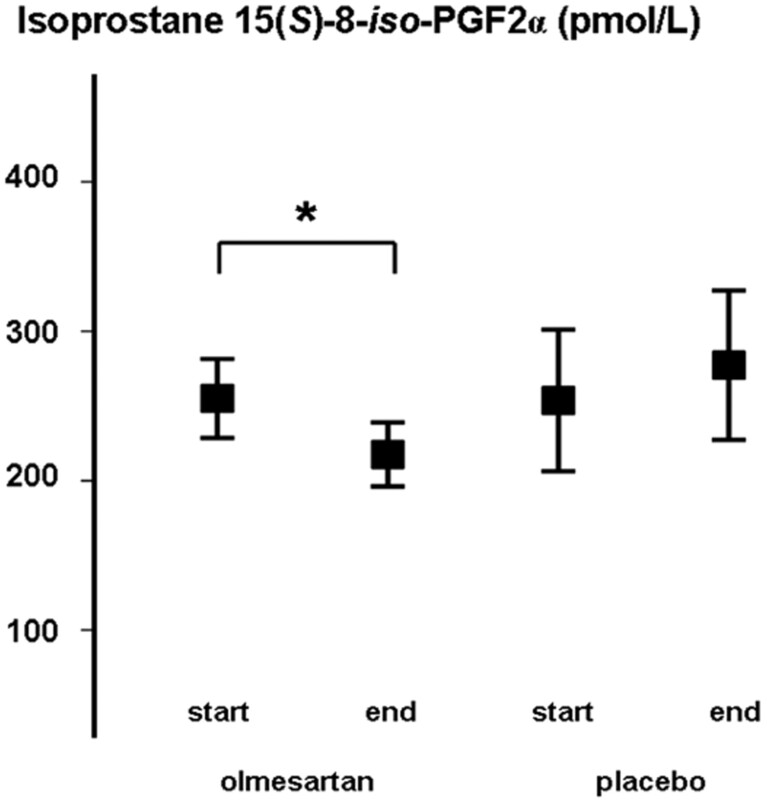 Furthermore, plasma isoprostane 15(S)-8-iso-PGF2a levels decreased significantly in patients who were treated with olmesartan but not in the placebo treatment group (Figure 2). Plasma 8-isoprostane 15(S)-8-iso-prostaglandin F2a concentrations in patients with type 2 diabetes before and after chronic treatment with the Ang II receptor antagonist olmesartan (n = 19) or placebo (n = 16). Data are shown as the 95% confidence interval of the mean. *P < 0.05 versus baseline. The results of the present prospective, double-blind, placebo-controlled study provide first evidence that chronic treatment with an AT1-RA in patients with type 2 diabetes significantly reduces RVR and increases (postglomerular) renal perfusion despite a significant decrease in systemic BP. Systemic hypertension, particularly increased systolic BP, not only predisposes to the development of diabetic renal disease but also accelerates its progression (18,19). In addition, in animal studies, increased glomerular capillary hydraulic pressure (i.e., intraglomerular capillary hypertension) as a result of Ang II–mediated efferent arteriolar vasoconstriction has been identified as a potential therapeutic target for prevention of progressive diabetic renal damage, and the use of RAS inhibitors attenuated the course of renal disease in diabetic animals independent of their effect on BP (20). Thus, our results document that the favorable renal hemodynamic action of AT1-RA observed in acute experiments in individuals with type 2 diabetes persists even after prolonged AT1-receptor blockade. This effect may contribute to the renoprotective effect of AT1-RA documented in large prospective trials on prevention of progression of diabetic nephropathy (21–23). Direct measurement of intraglomerular pressure is not feasible in humans, but the assessment of filtration fraction provides a good estimate of this hemodynamic parameter. Chronic therapy with the AT1-RA olmesartan significantly reduced filtration fraction, and this was the consequence of increased ERPF, because GFR remained unchanged. Thus, our results extend previous findings that AT1-RA decrease BP without significantly affecting GFR (24). In the placebo treatment group (HCTZ and atenolol co-therapy), we observed the opposite changes in renal hemodynamics: An increase in RVR and filtration fraction and a decrease in renal perfusion in parallel with a small decrease in BP. However, we cannot exclude the possibility that these unfavorable changes in renal hemodynamics resulted, at least in part, from a carryover effect of the BP reduction in the taper-off period. In addition, the β-receptor blocker co-therapy might have influenced renal hemodynamics. To elucidate potential mechanisms that could be involved in the renal hemodynamic effects of AT1-RA, we measured several parameters of the l-arginine/NO pathway, because studies in patients with atherosclerosis have revealed that AT1-RA therapy improves endothelial function by increasing (local) NO bioavailability (25,26). It is known that the renal microvasculature reacts particularly sensitively to changes in NO bioavailability, e.g., NO synthase inhibition by exogenous or endogenous inhibitors such as ADMA (14,27). Moreover, the age-related increase in RVR and decrease in renal perfusion have been linked to NO inhibition as a result of increased ADMA blood levels (28). We did not find significant changes in plasma nitrite and nitrate concentrations as indirect markers of (systemic) NO metabolism with both olmesartan and placebo therapy. Furthermore, plasma ADMA concentrations were comparable before and after the active treatment period in both treatment arms. Thus, we could not confirm results of a recent small study in which an AT1-RA treatment for 1 wk significantly reduced plasma ADMA levels (29). In contrast, chronic olmesartan therapy markedly increased plasma active renin levels in patients with diabetes. We interpret this finding as profound RAS inhibition via the AT1 receptor by olmesartan with consecutive stimulation of renin secretion to overcome RAS blockade. We cannot rule out the possibility that the significant BP decrease achieved with olmesartan therapy contributed to this effect. Placebo treatment did not affect active renin levels despite a small but definite reduction in BP, however. We have found a significant decrease in plasma isoprostane 15(S)-8-iso-PGF2a levels with chronic AT1-receptor blockade, i.e., a reliable biochemical marker of reactive oxygen species (ROS) generation and oxidative stress (17). Our results are in line with findings of previous studies and provide further evidence for the assumption that AT1-RA have beneficial cardiovascular effects that are unrelated to their BP-lowering action, e.g., anti-inflammatory effects (30) and reduction of oxidative stress (25,31). It is interesting that in the study by Wassmann et al. (31), treatment with 16 mg of candesartan for 6 wk reduced plasma 15(S)-8-iso-PGF2a concentrations in hypercholesterolemic patients to a similar extend (i.e., approximately 13%) as 12 wk of olmesartan therapy in the present study (i.e., approximately 14%). Our finding of reduced isoprostane generation with chronic AT1 blockade in patients with type 2 diabetes may have important therapeutic implications. Recent experimental studies have revealed that ROS overproduction induced by hyperglycemia and growth factors such as Ang II may cause direct oxidative injury to renal tissue and thus contribute to diabetic renal damage (32,33). In addition, ROS may act as signaling molecules that activate intracellular pathways involved in the transcription control of genes encoding extracellular matrix proteins and enzymes regulating their turnover. As a consequence, the altered extracellular matrix turnover causes glomerular damage. Moreover, the ROS signaling pathway may in turn upregulate intrarenal Ang II production, thereby creating a positive feedback loop that perpetuates renal damage (32). It has been shown that antioxidant therapy obliterated ROS generation in glomeruli of diabetic animals and, in parallel, reduced glomerular hyperfiltration and albuminuria (34). Thus, chronic AT1-receptor blockade may prevent (vascular) renal damage in patients with diabetes not only by direct hemodynamic effects but also via reduction of inflammation (30) and/or ROS generation. We have assessed the renal RI in parallel with invasive measurements of GFR and ERPF to evaluate the utility of this method for noninvasive monitoring of renal hemodynamics with chronic therapeutic interventions. Previous studies in patients with type 2 diabetes have indicated that an increased RI is associated with the presence of established diabetic nephropathy, i.e., higher grade albumin excretion rate accompanied by reduced creatinine clearance (35,36). It therefore has been speculated that RI in patients with type 2 diabetes could serve as an easy-to-assess indicator of progression, similarly as has been suggested for other renal diseases (37). Because biopsy studies are lacking, it is not clear whether a high renal RI in patients with diabetes is merely the result of structural changes of renal vessels (i.e., arteriosclerosis) or whether structural and/or functional changes of larger vessels (e.g., aortic stiffness) also play a role. The observation of a significant influence of lower body macroangiopathy on RI in patients with diabetes points to the latter possibility (35). This is further corroborated by the finding that a high RI was accompanied by signs of atherosclerosis in other vascular beds such as carotid arteries (36). In the present study, we found a small, nonsignificant decrease of RI only with the AT1-RA therapy, whereas RI remained nearly identical in placebo-treated patients. However, compared with the significant changes of invasively measured ERPF and filtration fraction, the measurement of RI did not provide useful information on the influence of AT1-RA treatment on renal hemodynamics after a treatment period of 12 wk. In conclusion, chronic treatment with the AT1-RA olmesartan reduces (intra)renal vascular resistance and increases renal perfusion despite significant BP decrease. In addition, olmesartan therapy significantly reduced generation of isoprostane 15(S)-8-iso-PGF2a, a marker of oxidative stress. These effects of continuous AT1-receptor blockade may contribute to the beneficial long-term renal effects of AT1-RA in patients with type 2 diabetes. This study was supported by SANKYO Pharma Europe. The laboratory and technical assistance of S. Graf, B. Beckmann, F.M. Gutzki, and M.T. Suchy is gratefully acknowledged.